Our monitoring platform allows you to make smarter decisions. Our certified verification process eliminates erroneous reviews and records​ giving you trusted​ and more credible info to make the right choice. Our ​list of Verified handicapping service providers have been background checked and monitored to make certain their records are as stated. Our software tracks the records of the Guaranteed Sports Handicappers and provides the top 4 services for each sport. We’re not a handicapping service, we verify handicappers to help you choose the best option. *Must post a minimum of 25 picks per month to remain included as a verified sports handicapper. Verified Cappers gives you easy access to the complete picks history of every online sports handicapper registered with VerifiedCappers.com. The VC automated verification process eliminates false reviews and records​ and allows for 100% picks records transparency. Looking for help this season? Team up with the season leaders at Verified Sports Handicappers. 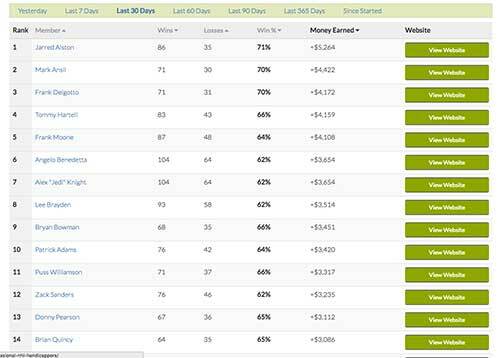 If you are looking for a trustworthy sports handicapper, visit our Verified Sports Handicappers. *Not all services have records available. Each service must provide our firm with a live updated feed of picks in order to have records tracked. If you are interested in having your service monitored please contact us for rss feed data requirements.